If you lived in Tulsa, Oklahoma a few years ago, it’s likely that you weren’t the first one to rise in the morning. That’s because Olivia Hauger, born and raised in Oklahoma’s second-largest city, made a habit of waking up before the general population as part of her daily regime. To trace the success she’s achieving today as a star for the Bears, you simply have to observe a typical morning of Hauger’s life as a 15-year-old. With the sky still dark, Hauger rolls out of bed as she mentally prepares her daily checklist. Morning practice. School. Afternoon practice. Homework. Tournament prep. Sleep. But before heading to the local tennis courts, she grabs a coffee for her coach, Thomas Liversage, a retired player who also coaches at the University of Tulsa. While she waits for Liversage to arrive, Hauger begins to warm up. When he steps foot on the court, she hands him his coffee and he joins her for their morning session of hitting. On many occasions, Liversage attempts a cross-court shot, but the young protégée is a step ahead of him, already having predicted his move. Hauger has trained herself to master the art of understanding her opponent, a skill that made her stand out as a blossoming recruit. Her morning routines were extreme in their own right, but then again, her accomplishments today are far from mundane. 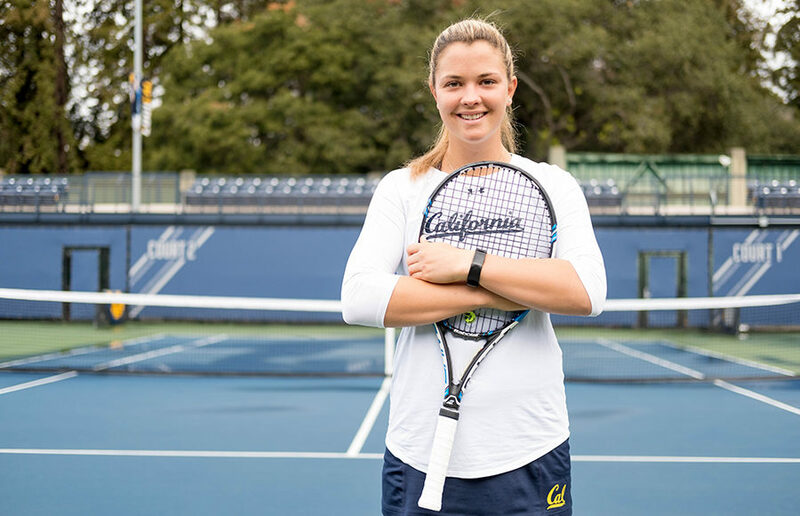 Now a junior with the Bears, she made history as the first Oklahoman ever to join Cal’s tennis program, clinched a national championship match in her freshman season and ignited her evolution into an impactful student-athlete whose heart and mind have carried her to preeminence on and off the court. For a city that is landlocked in the middle of the United States and lacks a professional sports franchise, Tulsa is actually a hotspot for a variety of different sports. It’s the home of minor league franchises for five professional leagues, two Division 1 schools and one of the leading tennis facilities in the country — the Michael D. Case Tennis Center. This is the backdrop against which Hauger’s journey began. “With international tennis and traveling, many boys and girls do online school, and I managed to continue to go to a public high school and have my social side, my tennis athletics side as well,” Hauger says. Growing up within Tulsa’s bustling athletic scene, there was no shortage of ventures for Hauger to explore. After experimenting with various sports, she was presented with the dreaded choice that all student-athletes must make. It was a balancing act that, at the time, was exciting for the family cheering on a young athlete excelling in multiple sports. But something had to give. Near the beginning of high school, Hauger made the first of key decisions that would ultimately set her future in motion: She set aside her cleats and shin guards. With soccer now a secondary hobby, tennis became the focus of Hauger’s life. It was around this time that the family met Liversage, a mentor who helped take her game to the next level. Hauger’s extra effort during those early mornings paid off as she earned several opportunities to compete on the international stage. Although competing in qualifying rounds of the 2014 junior French Open and a second-round appearance in the 2015 junior U.S. Open were enough to inspire her family, it was Hauger’s 2014 stint at the junior Australian Open that stands out the most. 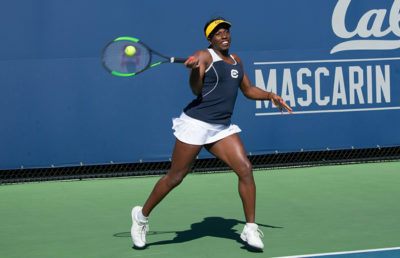 After she qualified for the main draw, Hauger’s parents, Alice and Robert, decided at the last minute to make the trip to see her compete in her first junior grand slam. “She won her first round and we were like, ‘Oh, my God, she won her first junior grand slam match!’ and so we were so over the top,” Alice Hauger reflects. Hauger’s next opponent? Top-seeded Varvara Flink, the then-No. 2 overall junior player in the world and heavy favorite to win the event. Rather than try to outplay Flink from start to finish, Hauger ended up outsmarting one of the world’s best junior players — on one of tennis’ biggest stages. After stunning Flink in the first set, Hauger kept her foot on the gas pedal and delivered a 6-4, 6-3 upset. Hauger’s international success coincided with her name popping up on the radar of several Division 1 programs. A seasoned player at such a young age, it was simply a matter of figuring out where she would fit in best. The stars aligned when Cal head coach Amanda Augustus jumped at the chance to recruit Hauger, responding earlier than expected to Hauger’s email sent out to a list of select schools. Alongside her international competitions and intense workout regime, Hauger boasted a weighted 4.8 GPA at Booker T. Washington High School and was on track to graduate a year early. Being in unfamiliar surroundings can create stress on anybody, regardless of one’s story. As a 17-year-old freshman in her first season, Hauger arrived in Berkeley as the only member of her family who attended college outside of Oklahoma. Valuing a balance between academics and tennis, Hauger chose Cal and left behind the familiar confines of Tulsa. And just as choosing tennis over soccer dictated her future endeavors, the decision to graduate early and head west has paid off immensely. On the court, she produced a 30-6 singles record as a freshman, earning the title of 2016 Pac-12 Freshman of the Year. Because of her analytical approach, Hauger’s young age didn’t stop her from making an immediate impact for the Bears. That season, it became clear that Cal had something special brewing. In Hauger’s second season, she possessed a flair for the dramatic, clinching a team-high seven wins and leading the Bears with 29 doubles wins. As this year’s team ushers in a young core consisting of five freshmen, Hauger’s role has extended beyond the white lines. Key decisions will continue to shape Hauger’s future as she enters the final chapters of her Cal career. But as an individual with a track record for being successful in multiple facets of life at the same time, it’s safe to say that there are big things ahead. Last summer, she returned home to train while also interning at an investment firm in Tulsa. A recent school paper she wrote on female student-athletes has her thinking about a potential career in sports management. “That (paper) was really inspiring to me and showed me that while there’s been many improvements, such as Title IX, since 1973, there’s still a lot of work to be done in female athletics,” Hauger says of her research. Whether she decides to extend her tennis career or enter the business industry in an investment or sports management role, her preparation and eagerness to explore a variety of possibilities is at an all-time high. “The great thing about (choosing between tennis and business) is that Cal has prepared her to do either,” Robert Hauger says. Across most sports, it takes a variety of different tools to be successful — speed, power and the right mentality, among others. If there’s one thing about Hauger that stands out, it’s that her abilities transcend sports and extend to other aspects of life. “Being able to accept and embrace the challenge of managing all of these different things, whether it’s socially, academically or with sports, I think I stay pretty levelheaded throughout and try not to get overly involved in one of those areas while the other ones suffer,” Hauger says.